A Heat Recovery Ventilation system will save you money and reduce your energy requirements for heating by re-using the heat that is normally lost via standard extract systems. A Heat Recovery Ventilation system is designed to operate continuously at a low rate to minimise electrical energy consumption. The heat recovered is up to twenty times the energy used to run the fans. 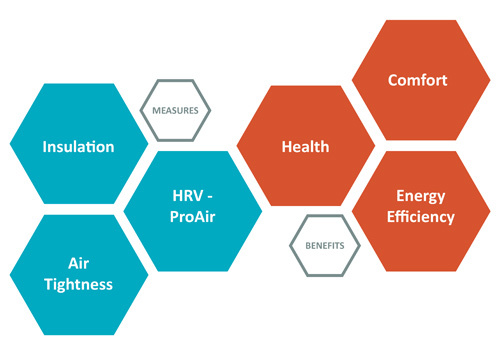 Comfort levels are superior in a house fitted with a Heat Recovery Ventilation system. Fresh, filtered, warm air is provided year round regardless of the weather outside. Sound pollution will also be avoided as the only holes in the walls will be connected to the HRV unit with sound attenuaters controlling sound entering building.